I returned riverside to capture the Red Cliffs in the lowering sun. In my last painting session there, the afternoon light and shadows caught my eye and I made a mental note to return to the same spot. I was eager to put paint to canvas when I arrived. Though the river at my back flowed effortlessly, things weren’t moving as well with the painting. I struggled with the angle I’d chosen, fighting to find the right shapes and values. The afternoon grew surprisingly hot and I could genuinely use the excuse “the sun was in my eyes”, because as I struggled with light, shadows, and glare—on and off the canvas—the sun marched over my left shoulder and into my eyes. Finally, I moved into the shade, next to the river where I got a clear look at the mess I’d made and began pondering my next step. Something wasn’t quite right. Later, when I showed the painting to Clint, he pointed out the resemblance of the rock folds to a female body part. Since then, that’s all I see when I look at it. Consequently, the painting has been relegated to the “do-over” pile. I was nearly out of day as I daydreamed to the gurgle of the river and gathered up my brushes. I looked out over the river, struck by the foliage along the far shore glowing gold, orange, and lemon yellow in the last light of the sun. The brilliant reflections in the water flamed against the encroaching mossy-black shadows of the coming evening. I knew I didn’t have much time—I grabbed another canvas, quickly squirted out a few more colors onto my palette, and got to work. 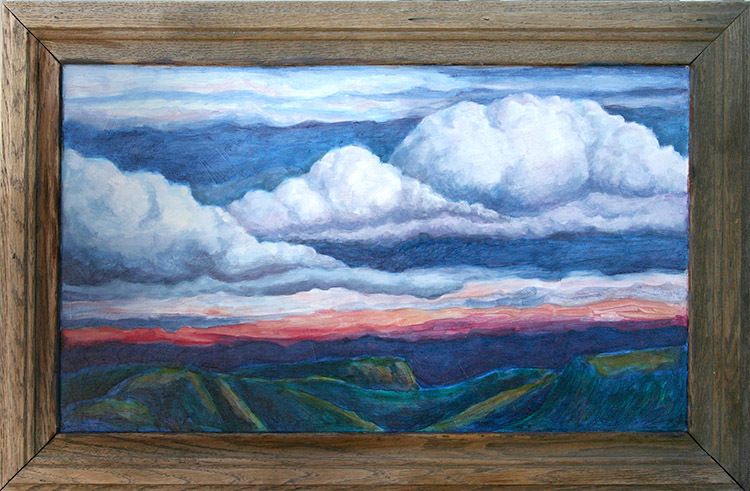 I painted until the sun dipped behind the ridge. The vivid colors gave way to soft edges and muted tones as the sky cooled to twilight. I had to get out and paint—a strong urge I could not ignore. I loaded the car up with everything. Usually I gather up just my watercolors, but this time I thought I’d try painting with acrylics. That meant more stuff, but for where I was going, it would be manageable. 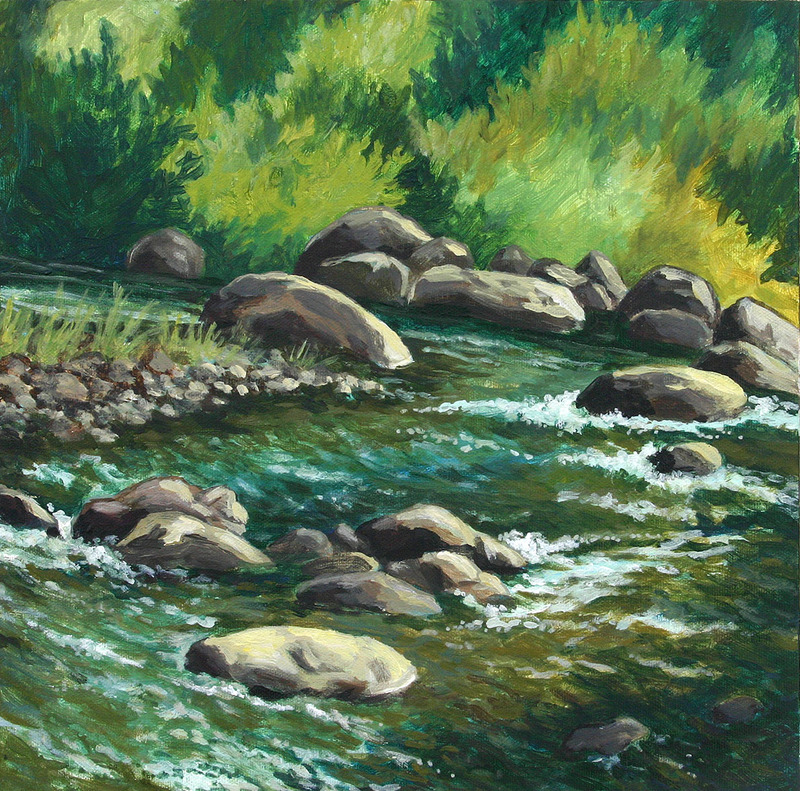 I’d seen a spot along the Animas River that looked promising and the river had been begging me to paint it. The Animas is special. It holds a singular place in the hearts of the people who live here and I’ll bet many who visit the region take the river home in their dreams. I know I did before we moved here. I thought this tie to the river was just my own kooky nature nutty-ness. Soon, I realized it wasn’t just me. Its full name, River of Lost Souls, might hold a clue. Are we drawn to it because, we ourselves are lost souls? Or, perhaps because we are found again—here along the Animas? Maybe the river is a thread to the lost souls in each of our lives. Somehow, I know that whoever named it must have felt this connection too. It was a bright, clear, cool autumn morning that we all live for. The river sparkled in the sun. I found the perfect place to camp out where the morning light tickled my artistic soul. About 5 hours later, I left with this painting. The rain often comes in the late afternoon and early evening. Most astounding, is when the rain marches towards us from the west, with a glimpse of what lies behind the coming shower—a band of sunset—gold, coral, and pink gleaming below the cloud layer. 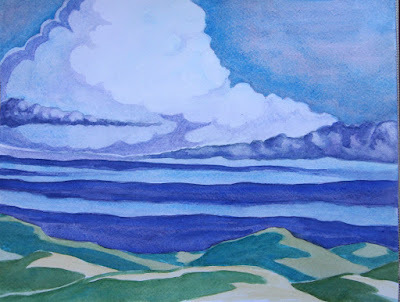 Above, is a different sky of water-laden billows framed by swaths of purple and deep blue where the light of the setting sun has been sealed away. 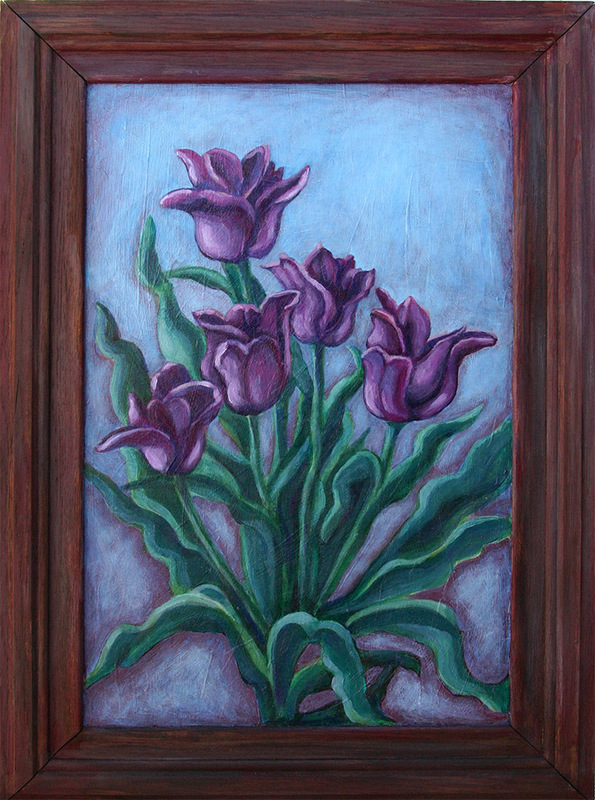 This piece is painted from memory on a salvaged cabinet door. I’m so glad I still have a few left. I love painting on this surface. I’ve been cruising alleys in town—ever on the watch for castaways to add to my “canvas” collection. I’m not sure if I decided on this title because I’ve been obsessed with skies, or if it’s because there is no “ground” painted into this piece. I started this painting back in spring. I was here alone, while Clint was somewhere between Colorado and California, hauling a trailer jammed to the gills with stuff that, someday, we’ll wonder why we moved. It was a day where spring teases you: warm with a hint of what’s to come. However, once the sun waned, the lingering winter returned, and I ended the painting session wearing a sweatshirt. The poor painting languished for months, sitting in the living room reproachfully reminding me that it wasn’t quite done. After a while, I added ground. I hated it. The tulips lost their light, dancy feeling, so I painted it out and left them floating, haloed in a haze of purple against a pale sky. Luckily, acrylic paint allows you to cover over bad decisions (and regretfully, sometimes good ones). By the time I was ready to finish this painting, we were well into summer; sweltering, the cool spring a distant memory. We hadn’t been camping in I-don’t-know-how-long—more than a year (the horror!). We planned to meet up with our dearest hiking and camping compadres near Flagstaff and camp near Sunset Crater. We were beyond excited. The first day a few of us hiked up out of Lockett Meadow towards Inner Basin. It was steamy, but beautiful climbing the trail through the dense aspens. One of our younger hikers, 8-year-old Joe, said, “This place is like a dream.” It was. The next day, we went from wandering Wapatki in the intense heat to shivering around the picnic table that evening as it poured down rain. In classic monsoonal fashion, the storm gathered itself for an afternoon show, starting with cracks of lightning and rolls of thunder that rattled your bones. A few close strikes had us involuntarily erupting in shrieks and squeals—quickly covered by nervous laughs. We huddled under a tarp for a cozy dinner—enjoying the adventure. Eventually it stopped raining and we lit a fire that somehow steamed into life. The stars were lovely, but after several hours of cold and wet, warm sleeping bags called our names. After we’d snuggled in and called out “Goodnight John-Boy” tent to tent, it started to rain again, a soft patter off and on through the night. 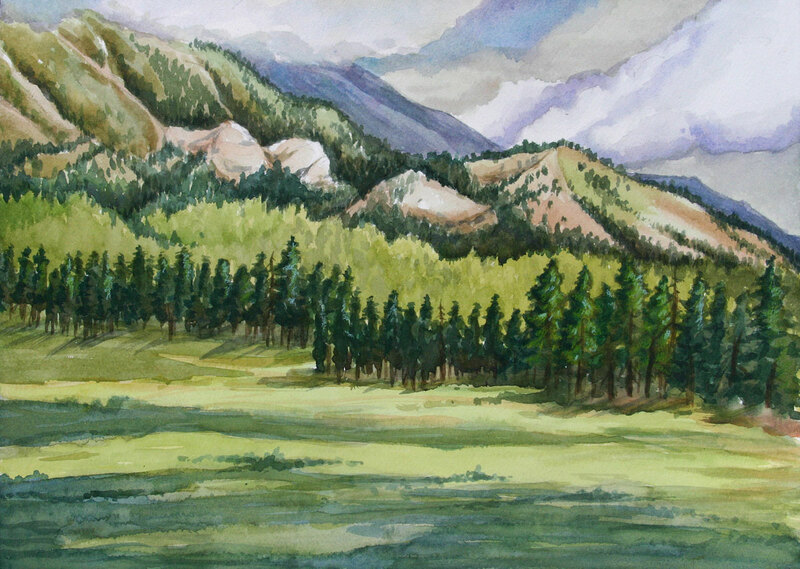 In the morning, we found blue skies and I seized the opportunity to paint this meadow, glowing green from recent rains, framed by the San Francisco Peaks still shrouded in clouds. Later, once again the clouds thickened and gave us a bit of rain. But by the time the dinner dishes were done, the skies had cleared, giving us plenty of time to sit around the campfire laughing together as we had so many times before. Come morning, we packed up to go our separate ways: our friends heading to the west, while we turned to the east. It was so hard to say goodbye. Often, there are layers upon layers of clouds— each lit in different ways. This cloud memory: a bright backdrop, overlaid with dark strands of purple clouds, the foreground glowing green from recent rains. Coming to Colorado from a place where clouds are rare—rain even more so—this has been a visual delight. Every time it rains, we do a happy dance. With this painting, I wanted to use simplified shapes to create a more graphic result.